The MBBA Committee comprises at present ten members, all of whom offer their services voluntarily. They are, or have been, horse owners and riders, some just happy hackers and some serious competitors. Our latest committee members are Anne Pearse, Debbie Pickford and Caroline Bannell. Anne runs a livery yard and has lived in Mendip for most of her life so her local knowledge of old routes is invaluable. Debbie is competing in the Wilberry Wonder Pony challenge this year. She has just qualified to be the local clearance person for her area via SCC, having completed her training in July. So a very useful person to know. Caroline has been a very supportive member of MBBA for many years and now has finally been persuaded to join the Committee. She is a rider and keen campaigner for Access in the countryside for all. We meet about three times a year and have a varied agenda for every meeting. We spend time discussing fundraising for our various projects and site visits are arranged with Somerset County Council and our contractors. Each project takes time to get agreed and quotes must be given. The route is photographed and a job specification worked out. The work is then agreed by SCC and we give the contractor instructions to start work. As well as work on existing routes the committee researches old maps to find ancient routes no longer in use. A Definitive Map Modification Order is submitted for these routes and the long wait begins as it can take up to 12 years before a case is brought to a legal decision. Along with our visits, events, rides, demos and clinics we are all kept fairly busy but are always happy to be contacted if we can be of help with a bridleway related problem. In fact if there is time, the Committee often muck in to help with clearance projects. 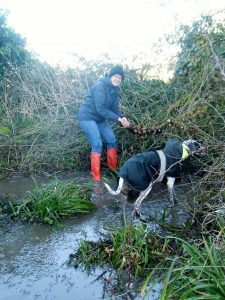 This is our Chairman Jo, up to her knees in water, clearing a ditch in Beckington! However usually we employ a contractor to do the big jobs!! !